Well, no one else would do it, I usually get things like a bar of very nice dark chocolate, maybe a bottle of tawny port or a book or two, but no one dares to get me tools. I'm picky you see, and the way I see tools may not be the same as the giver, so they leave me to make my own choices which is fair enough. Now a little while back I bought a Ryobi 18 volt 2 speed cordless drill, and in case you did not spot the blog posting about it, its crap! Absolute rubbish, a complete WOFTAM! ( Waste Of %*&%ing Time and Money). I bitched about the chuck, the way it fitted my hands, the charger and ---- Well, everything, and my opinion has not changed since. I mentioned that I'd be looking to buy something decent sometime, and recently when I was in at Robertson and Sinclairs local branch admiring the Festool range of tools manager Andrew Walton handed me the shops demonstration Festool CXS Li 1,3 Plus AUS driver drill kit. Heres who they are, branches in Auckland, North Shore and Hamilton. Brief specs, 2 speed, variable speed trigger, 10.8 volt, 8mm chuck. It has an unusual closed handle, lithium ion batteries ( 2 in the kit) , a right angle chuck mount, a standard three jaw chuck as well as a quick action hex chuck, and a small selection of drill mounts and such. All this in a particularly nice box shaped case which stacks with any other Festool box, they interlock so they are secure, have a latch which is both secure and able to be operated by fingers that might be wet, numb or encased in gloves, and is very professional in appearance. I took some pics on the digital camera, but then found these videos on it, they say it all and show its features very well. Its worth watching, it shows the tool off much better than I can. I used it, just a little, for some odd jobs around the shop and thought about it for a while, went back and used it some more, and after a bit more thought went back to Andrew. I now own it! Why? In random order, quick action chucks which snap on and off by pulling a ring fitting back, it means that one chuck can have the drill, the other the driver bit and switching them back and forth is a matter of seconds. Yes I know it would be ideal to have two complete drills, one for each, and I'll be there maybe next Christmas, but in the meantime its very very quick to change, much more so than switching bits in a conventional chuc. Its nice to use, smooth as silk in operation, very good progressive speed on the trigger, fits the hand very well and with some of the injuries I've let myself in for my hands are not as strong as they might be so thats very important, and that dee handle both protects and gives good leverage when driving something heavy. Remarkably small in size too, and very light in weight as well, hanging the bigger cordless drills off the end of your arm for a day is a recipe for sore forearms, this is great! Its powerful, way more torque in low gear than that Ryobi in spite of being 10.8v instead of 18v. It lasts a very long time on a battery charge, and there are two batteries in the pack so there is no excuse for every running out of charge, I know thats Lithium Ion v/s Ni Cad, but the result is the same. The right angle fitting for the chuck is helpful when working in close quarters, It just clicks on and off the same as the chucks do, pull the green ring back and its done. To say that I like it would be an understatement, and I know the above sounds like a rant, and these are not cheap but its such a pleasure to use a really nicely engineered and built tool. A guy who sells tea says in his advertising, "Try it, you'll like it"! That applies here as well. Anyone want a cheap Ryobi? Thanks Robertson and Sinclair, good deal, good product. John Welsford, who has his Christmas present already. Back again after a long trip away. A word of warning, don’t expect your email to work properly if you have a local network set up with two computers which use different internet browsers! But that aside, I’m recently back from 6 weeks in the USA, visited the Port Townsend Wooden Boat Festival where I met a whole lot of very nice and interesting people, gave two lectures on boat design and the history thereof, participated in a lecture by small boat adventurer Howard Rice, gave talks to the students at the North West School of wooden Boatbuilding and a local Rotary group. I enjoyed all of those, and will write up more on the show as well as the rest of the trip later. But first, huge thanks to our hosts Peter and Helen Leenhouts, we feel that we’ve connected in a manner that has gained us lifetime friends, great people who made our stay there memorable. Thanks also to Anika and Josh Colvin of Small Craft Advisor magazine, Howard Rice with whom I’ve been corresponding for years but met for the first time at the show, and so many others who made the show such a pleasant memory. Like I said, I’ll write more about the show, and about the rest of the trip later, I’m still in catchup mode after the trip away and will be for a while yet, so I’ll just touch a highlight here. That Highlight? A relatively small thing, and by no means the most important one but one which will remind me of the show and my new friends every time I use it. Ever been faced with a choice like that? So many treasures to choose from and only one allowed? The second most used hand plane in my shop is a Stanley 60 ½, a little low angle block plane which I use for light work, it fits one hand perfectly, cuts end grain as well as rounding corners and smoothing small areas, its versatile and very useful. I’ve two, one is near new but I much prefer the very old one I bought from a junk shop and rebuilt. Comparisons between the old Stanley 60 1/2 low angle block plane and the Lie Neilsen of the same size and configuration. While the differences may not be obvious, they are quite different to use. Back at home in my workshop, I tried it. Even straight out of the box it cut beautifully, and with a very light hone on a 4000 grit waterstone it made silky transparent shavings even from curly grained beech. Ahhhh! I’ve taken some pics below, you can see the blade bed in the Stanley is not machined, the adjustment ok but not brilliant, and the blade very thin in comparison to the new one. The weight of the LN plane is considerably higher, the tool a better fit in the hand, and the whole function much improved. The old one did the job, but the new one is a real pleasure to use. Worth the money? You bet! Its only three sleeps until we’re off in the big silver bird on the 6th. 6 weeks travelling in the USA, visiting friends, going to interesting places and events, and talking to people. We’re starting off with three days at the Port Townsend Wooden Boat festival across the other side of Puget Sound from Seattle, its 12 years since I was last there and I’m sure I’ll see lots of improvements and changes. 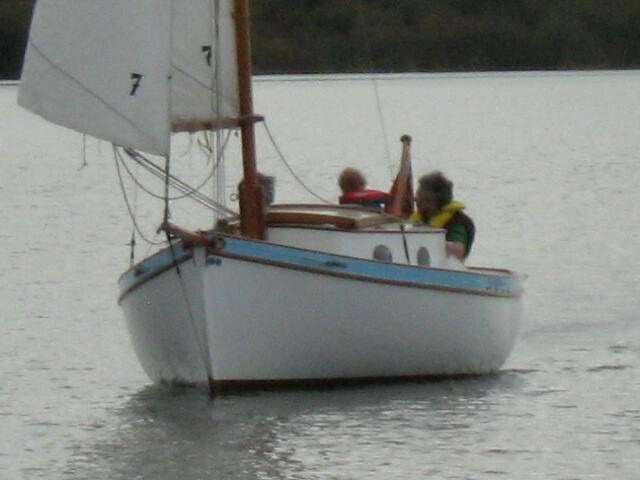 We’re to be guests of Peter Leenhouts, a director of the NorthWest School of Wooden Boat Building and I’m to meet the instructors and students there to talk boats, I’ve two talks to give at the festival itself and hope to make it to a meeting of the local chapter of the Traditional Small Craft Soc. Lots of talking, some listening too as this trip is in part research for future design work. This is going to be interesting for me, Russell Brown and Richard Woods, both renowned designers of multihull sailing craft will be there and meeting up with others who practice the same craft that I do, ( even if their boats have more hulls than mine) is a rare treat. Anyone wanting to catch up with us during the show should go to the Small Craft Advisor magazine stand and ask Editor Josh, I’ll be around there a lot, and if not then wont be far away. Just ask. Talk to him about SCAMP and the magazine while your there. From there we travel right across to the other side of America to Maine, and the WoodenBoat magazine offices where we’ll be guests of Editor Matt Murphy and Publisher Carl Cramer. 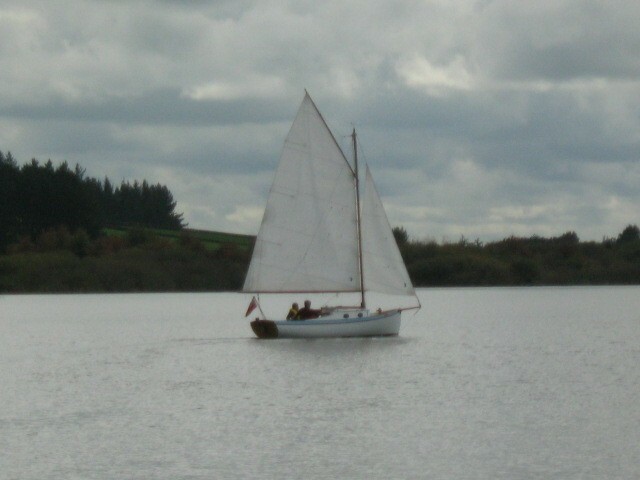 As well it’s been a while since I was there and I’m looking forward to renewing old relationships, talking boats, writing, teaching, sailing, and checking out the scenery so different from the other coast. Bob Hicks of Messing About in Boats magazine is driving up from Wenham to spend a day with us, I suspect that we’re going to talk classic racing motorcycles, a passion and experience we both share. It’s a bit of a wake up call when the machinery one sweated to pay for, got hands greasy while mechanicing and raced is suddenly considered a classic, a sign that the years are flickering past at an alarming rate. Anyway, Bultacos, Aermacchi HD racers, BSAs and so on will be where we’re at. Oh, and a little bit about boats. It’s a long way from Maine to San Antonio, three flights rather than the two from Seattle to Bangor, and we’ll be travelling from 25deg c days to 40deg c days, hard after coming from early spring in New Zealand where a 16 deg day is about normal but no doubt we’ll manage. Cool drinks, light clothing, big hats and shade, should work. Leo Hill ran my jwbuilders yahoo group for years, he’s a good man and will be picking us up and hosting us for a few days and showing us around San Antonio, he’s bought a Suzuki Vee Twin cruiser, yes, two wheels again, and we’ll be out having fun on that as well. I’ve no doubt that the breeze as we ride will help us cope with the heat. 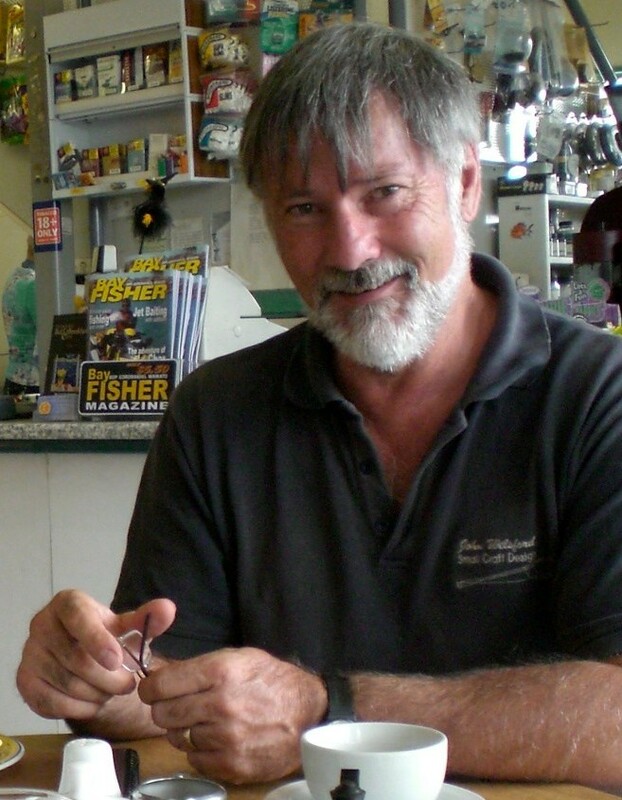 We meet Chuck Leinweber of www.duckworksmagazine .com at Canyon Lake small boat messabout on 24th Sept, and will be talking to anyone wanting to come and say hello. It’s my second visit to that venue and I’m very much looking forward to seeing some of the characters I met last time. If you miss that one there is another gathering the following weekend at the Centex messabout at Inks Lake, another chance for me to talk to interested and interesting people. Chuck and Sandra host us for nearly two weeks, then, with Chuck at the helm of the car and a boat on its trailer behind we head off on the long drive up to Lake Eufaula for Sail Oklahoma where Jackie and Mike Monies will be our hosts during the Columbus Weekend event. Although only in its second year this has attracted an entry of close to 100 boats and twice that number of people, and hosts the Puddleduck racer world championships. I’m told I’m entered in that latter competition in a “Kiwi PDR” of my design and am looking forward to it even though it’s a very long time since I was a competitive skipper. This too will be a chance to meet other designers, Graham Byrnes and Jim Michalac will be there, and between the three of us we cover a very wide range of boat designs, different techniques of construction and design theory. Its going to be a busy weekend but I do hope to get a chance to sit down and swap ideas with these two. From there it’s back on the road to San Antonio, back to Harper TX and Casa Duckworksmagazine then back to Leos where we plan on just blobbing out for a couple of days before the long long series of flights back to New Zealand. This trip, being blunt, is a big chunk of money, and its only been made possible by the very kind support of Sandra and Chuck Leinweber of Duckworksmagazine and boatbuilders supplies. Thank you so much guys, it will be great to catch up with you again. Thanks also to the others who have volunteered to host us or help us along the way, it’s a humbling experience to find that people who only know me through my work and my writing think enough of me to pitch in and help. Thank you everybody, thank you. Its the interaction with the customers that makes this job so good, lets face it, if I was only doing it for the money I'd be better off mending roads, but the people who have such confidence in my work that they commit years of spare time and a lot of cash to build my interpretation of their dream make me feel very proud. 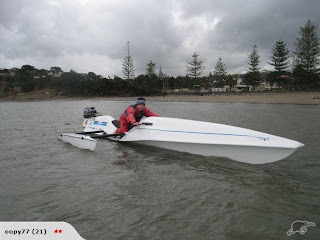 I'd had a few exchanges of emails with Chip Matthews about the boat he wanted, and he bought plans for my Pilgrim design http://www.jwboatdesigns.co.nz/plans/pilgrim/index.htm . That was late 2009, I think he started the build about Christmas, and I had the occasional question and progress report until he launched her a month or so ago. Just great, I dont need to go on about it any more than I have, his photo album tells the story. Thanks Chip, that makes the late nights and inky fingers worth it. Man overboard. Another winter job. 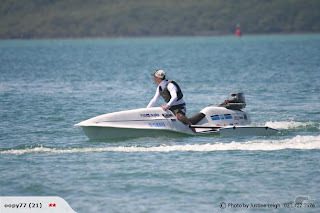 Winter jobs, I’m not doing much sailing at present, the weather here in New Zealand never gets so bad that its out of the question but I’ve a heap of other things to do plus a multitude of little “improvements” to do on the boat. Some to do with comfort, some with the boats function and, some with safety. While falling over the side of your boat is something that we avoid where possible, it happens. Getting back aboard is an issue. Even the height of the sides on a small dinghy can be a barrier hard to scale when cold, tired and weighed down by soaking wet clothing, and a bigger boat is just impossible. A boarding ladder is the ideal, one of the folding ones that bolt to the transom, but in my case the budget does not stretch quite that far just yet so I had to come up with something workable, just in case, I’m not planning on falling in the ocean but, like I said, just in case. Back at the after end of the boat are a pair of good sized bronze cleats intended for tying the boat up to a wharf or whatever, and they are accessed through closed fairleads ( chocks in “American” ). These fairleads and cleats are big enough to have more than one rope in use, so for each side I spliced up a length of rope with a good sized loop on each end, threaded one loop through the fairlead and onto the cleat< I threaded it through between the cleats legs and doubled it back over so it cant slip off . The rope and free looped end sit nicely on deck just inside the little bulwark, out of the way, and I leave the end of the free end loop just through the fairlead so I can grab it from outside, pull it out, put a foot in the loop and with hands over the bulwark I can stand up in the water enough to get my upper body over the rail and with a bit of flailing around get a leg up and lever myself on board. Not perfect, but a great deal better than nothing. Yes I have a safety harness. It will when I go sailing next, be clipped onto a jackline. Have I a jackline rigged yet? That’s another job to do. Hopefully by the time springtime comes around, the long list will have check marks beside most of the items on it. Being winter, its dark early, at least thats my excuse. So I finish my day by doing some digital mooching around looking for something of interest. 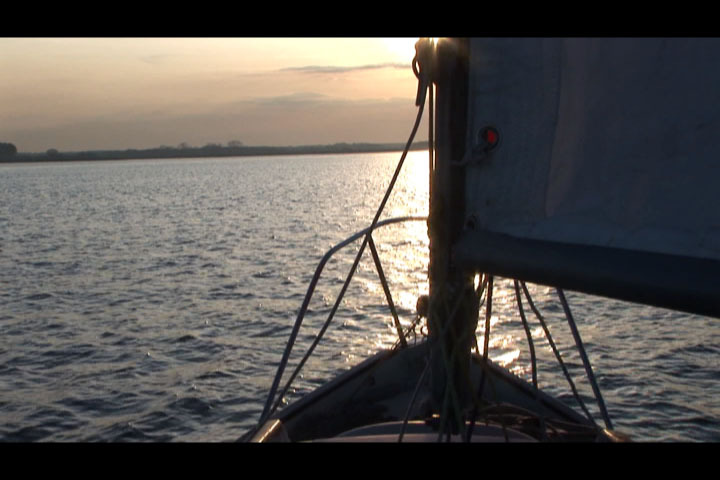 Dylan Winter has just posted a really lovely 25 minute video doco on an amazing yacht race with a difference. No Liquorice Allsort ocean racing wetties ( thanks Annie Hill) no screaming surfing runs in the southern ocean, just gentle and gentlemanly sailing up and down rivers and in ponds on the Norfolk Broads in England. Beautiful boats, whiskery skippers, pipes alight, trousers with braces to hold them up and straw hats, not a lifejacket or curseword ( There might be one in the whole 25 mins I think . This is the annual Three Rivers race. A really nice place to relax. Like most of us I spend a few minutes browsing the net after checking my emails each evening, looking for something entertaining and relaxing to end the day so I can leave the work part of my life with its annoyances and aggravations behind and enjoy the evening in a reasonable state of mind. Some of the things I find are anything but relaxing, some really make my hackles stand up, and generally I’ll avoid those “places” in future so I have a little list of regular “favourites” that I know will work. Now Dylan is a gent of a certain age with a pleasantly crumpled visage, clothing the same, and both boat and car not so rich that it’s hard for me to identify with him. He’s undertaking a voyage around the British Islands, not the biggest or the longest in terms of boat or distance, no Cape Horn in midwinter type adventures, no palm trees or dusky maidens, not even encounters with smugglers or rum runners. But I don’t get to have those sort of adventures, they are generally wet and uncomfortable, way out of my budget and don’t leave enough time for me to live the other parts of my life so its creeping up creeks, hopping from harbour to harbour and finding new crinkly bits of coastline to explore that interests me. Dylans voyage is a whole lot of that, he sailed his little sloop out of his home port, turned left, and will keep doing that until he gets back to where he started from. It’s going to take years, he’s exploring the myriad tiny ports along the way, putting his boats bow into every river, sailing up each of the estuaries he comes across and stopping at the towns at the head of each. There is a great deal to be seen in these places, and Dylan is an exceptional maker of video documentaries, applying his skills to this endeavour so we can share his observations on the history, the wildlife, the other boats and ships he comes across and the scenery. I must say too that his choice of background music adds greatly to the imagery. Dylan Winter, in "crumpled" mode. I feel like that a lot of the time. He uses Google Earth to show you the bigger picture, his camera for close-ups, and music for background and his commentary for flavour, it’s a combination well worked and it works well. There has been commercial shipping on the English coast for over two thousand years, way prior to the settlement of the “New World”. Many of us have roots there and for me as a New Zealander of UK ancestry its like a home I’ve only briefly visited, these tiny documentaries with their exquisite camerawork, dry humour and piquant observation are a real treat. Yes I can identify with them, the budget is similar to my own, the age of the presenter similar, he likes the same things that I do, he grumbles about the same things that I would and it all feels very much like home. Yes there is a small subscription, but it’s really worth it. The view over the bow of Sea Slug,there is a perfect anchorage up that river. This is what keeps a designer going. A couple of years ago I had an email from one Osbert Lancaster who lived on the shores of the Forth of Firth in the South East of Scotland. For many of us here in New Zealand that’s a place of ancestral connection, there are an awful lot of us with Scots forefathers, but its also a place that is much colder than we’re used to. However, it has very long evenings, long periods of calm weather and an incredible coastline dotted with ancient, and I mean many hundreds of years or in some cases over a thousand years old. Its an area that cries out for exploration by a boat small enough to creep in close to the edges of the water as well as tough enough should the weather blow up. This is the edge of the notorious North Sea after all. Osbert wanted to go our and enjoy this northern small boat paradise and chose to build my Walkabout design, http://www.jwboatdesigns.co.nz/plans/walkabout/index.htm , a boat that could almost have been custom designed for what he wanted to do, a boat that was more than capable of the job at hand. 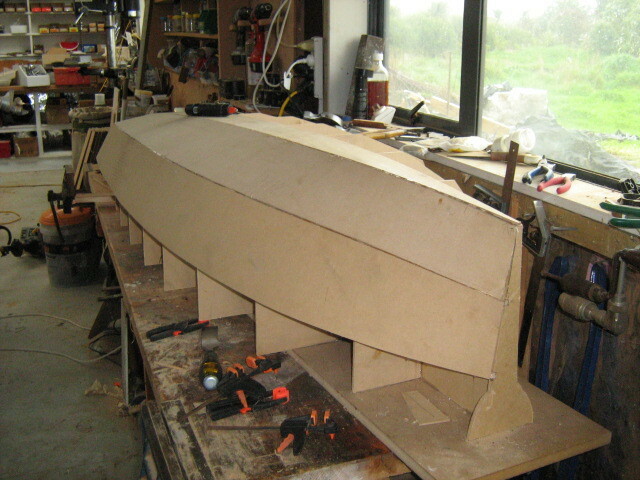 Osbert bought plans, had a part kit cut by Fyne Boat Kits over in Cumbria not that very far from his home http://www.fyneboatkits.com/ and got on with the build. I don’t mind hearing from builders, and sure sometimes I get the same question several times a day but I manage, its getting to know the people and following their frustrations and their joys, and then hearing about the adventures when the boats complete that really makes my day. A couple of good photos and a story about how much fun they had pays for the myriad emails and the chore of explaining for the nth time, how not to do something that I learned about years back. 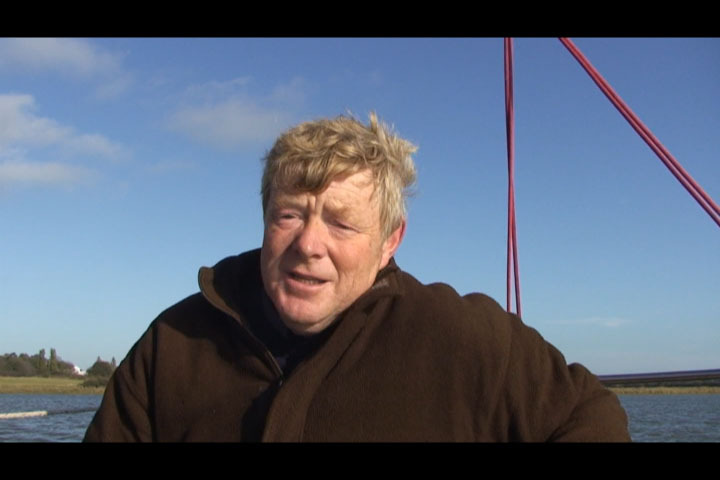 Osbert though seems not one to do things by halves, I’ve been getting reports from him on a regular basis, racing as a rowing boat, racing with the local dinghy club, cruising the waters of the Firth, and getting involved with the Dinghy Cruising Assn http://dinghycruising.org.uk/ . Today though, he topped them all, I spotted a reference on a boating forum to Osbert and Sail Caledonia, a “raid” type event that runs from Loch Ness ( yes, the place with the monster) on Scotlands West Coast, reknowned for fast currents and wild weather, through the Caledonia canal with Lochs, Locks and rivers, estuaries and sandbanks, through to his home waters on the Firth of Forth. Here she is at the finish. This event is a real test of man and machine, and I'm pleased to say that Osbert and Scratch both seem to have finished in good order and condition. Congratulations both. 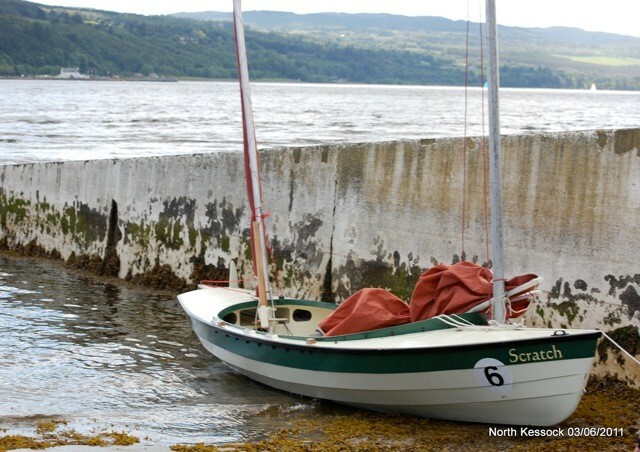 He’s collected some wonderful photos of his very nicely built Walkabout “Scratch” ( Number 6 on her bow in these photos) taken during the event, and I don’t think I need to elaborate other than to say he had a very good time, and for a beginner sailor in a home built boat has done extremely well. I loved the pic of Scratch surfing, but the one that really captures the spirit of dinghy cruising is the one with the tent up, a tiny but comfortable little home among all the other boats. Well done indeed. You’re an inspiration sir! It was a nice looking day, slightly cloudy and very calm. Our family does not get together as often as we’d like, two of us work shifts at the hospital, one is a fulltime student who will gain her nursing qualification in about another year, she’s a mother of a 2 yr old as well, and sometimes I’m not able to get away so its rare for all of us to be able to go out together. This day though, even though it was wintertime it was warm, mild and gentle so we packed a picnic lunch, the boat of course has a cooker to produce hot drinks so the thermos stayed home. We hooked the boat on and drove off to Lake Ngaroto where there is a lovely picnic grounds with all the trimmings, two superb boatramps and just enough of a lake to introduce the two year old to sailing. The boat is not really big enough for all of us, so the plan was to take two or three at a time and do a lap of the lake while the others enjoyed the peaceful park grounds and bush walks. It was nice to have help to rig the boat, it’s a goodly lift to get the mast up and sometimes that’s more of a heave than I want to do, and there are things where two sets of hands make it a lot easier and saves time, so it was not long before the big tarp was spread out with lunch organised, the boat rigged and in the water, and the puppy convinced that he was not to eat the sandwiches while we weren’t looking. Little Aysha is 2 years and four months old, a good age to introduce to new things as long as they are gentle, so we cast off with the small one, her mother Sarina and my Denny on board. There was just enough wind to move the boat at a very quiet walking pace, perhaps 3 knots in the puffs, and the puffs were close enough for us to coast from one to the next. All good, two laps, then in for a cuppatea and a crew change, out with son in law and daughter Sarina, Denny staying with the small ones, that’s granddaughter and pup, and in an hour we’re back for another crew change. It was like that until about 4 pm, nothing exciting, the little one showed a marked liking for going below and sleeping on a bunk, Sarina showed that she has not forgotten how to helm, son in lay was interested in sail trim, and Denny so enjoyed the day that she is talking about us renting a mooring over in Tauranga next summer so we don’t have to launch and rig, drag the boat out and un, each time we want to sail. Lovely day though, no excitement, just a nice day out with the family. A marina berth is about $350 a month which is a bit rich to my way of thinking, but we can get a swinging mooring for about a quarter of that, perhaps less. If it works out maybe we’ll buy one. Have a look on Google Maps at Omokoroa, Bay of Plenty, New Zealand . There are several moorings for sale here and a couple to rent by the month. The boatramp is at the end of “The Esplanade”. Good secure car parking, nice jetty with floating pontoons, and we’d hope to get a mooring up the river a bit in the sheltered part of the area. My little boat does not have a self draining cockpit, that’s a big job to fix as it would involve cutting the present cockpit sole out and rebuilding it about 100mm higher and fitting drains so its going to be a fitted cover until that can be done. I need a dinghy too and a roof rack on the car so I can carry it. 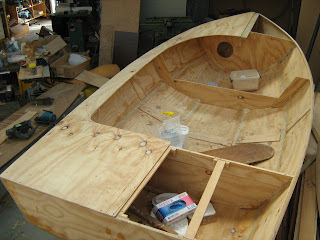 I’d buy a dinghy, except being a designer of boats am much more inclined to build one. Another job, I’m not getting all the outstanding ones done as it is, maybe I should just swim out and back. I use my two cordless drills a lot when boatbuilding, one for pilot holes and the other as a powered screwdriver. I have a friend who was an electrical engineer in the Merchant Navy and he tells me that if these had been around he’d still be at sea instead of teaching kids who don’t want to learn and rueing his occupational overuse sore wrists and forearms. But drilling wood, especially small sized holes, tends to clog the drill bit which if one is not careful can break the bit off which then requires some work with a chisel ( which then requires grinding and sharpening to get the nick out of the edge after digging the broken drill bit end out ) to retrieve it. The ordinary engineering twist drill is not intended for use in wood, they work, and like everyone else I use them most of the time, but the above problem is only one of the issues in using the wrong tool. Years ago I came across specialist brad pointed woodworking drill bits on boring machines, they had special chucks which is just as well or I’d have been collecting them for my own use, but at that time I could not buy them to suit my own drills for love nor money. Recently though, while they are uncommon I’ve seen them about, even managed to buy the occasional one. I use 1/8in (3.2mm) bits a lot, and had been working away using the last one in my collection and it was getting desperately blunt, when I was in a local hardware store looking for other things. Thought I’d look at the drill stocks in the tool section just in case, and while asking the lovely young lady there if they had any of these things, then explaining in detail what it was that I wanted ( be polite! ) , and looking over the display with her we were interrupted by a gent who was obviously a trade rep restocking. Turned out that Neil Palmer was the local Territory Manager for Robt Bosch, and like some of the other better power tool manufacturers Bosch are supplying an increasingly wide range of tooling and accessories for their tools. Neil had heard my request, said he had samples in his car and went out to get same. He came back with a set of seven drill bits from 3 to 10 mm in 1mm steps, ( no 9mm one). We discussed the use, he noted that I was boatbuilding and showed me the new tooling range for their oscillating Multi Cutter tool. He was keen to show me the titanium nitride coated saw blade which will cut wood infested with nails and screws, fiberglass, plastics, copper tubing and just about anything you’re likely to hit when doing repair and restoration work on an old boat. If you’re like me of course you manage to do this when building something new as well. Heres a link to the multitool itself. They do a cordless one as well. He mentioned too that these fit Fein multi cutters as well! Nice gear. I want one, but it has to wait until I’ve bought one of their new 14.4 volt cordless drills. Back to drills, on asking how much, I was presented with the sample pack and told to go and try them. Wow! So I did. These drill bits have a steeper flute than the engineering ones, the outside of the spiral being relief ground to reduce binding and lessen the chance of breaking the bit in a deep hole. The point in the middle is longer (higher? Something like that) than the usual ones which makes it easy to target, just put the point where you want the hole, press and you’re on your way, no wandering. They drill quickly and cleanly, much less breakout than the usual twist drills, and seem to hold their edge very well even when pushing through reinforced glue and plywood. Nice work Robt Bosch, and thanks Neil. Ten out of Ten. I’m sure that your local Bosch stockist will be able to get these . Yes I sound as though they are paying me, but I have several Bosch tools, their random orbital sanders in particular have had a terrible amount of abuse as had the angle grinder and they both do a good job and survive very well. These specialised woodworking drill bits are superb, I’m a fan. Saturday Night Special, a day or so later. I’m not doing well today, dog tired in spite of a sleep in, off to the Doc today for my monthly visit so I’m taking it quietly and am sitting here annoying you instead of working. 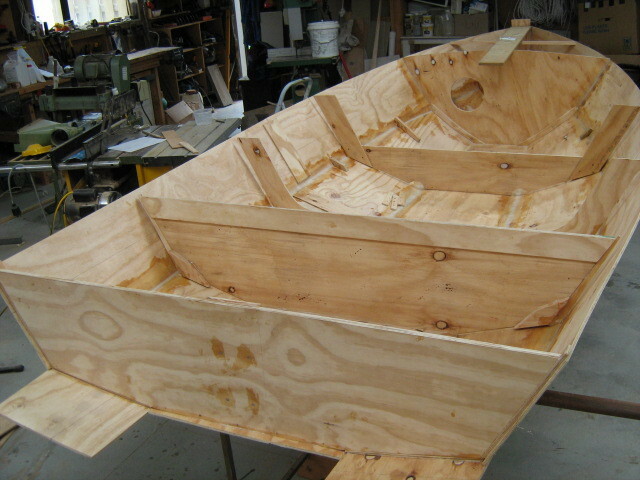 Its been a long time since I built a boat, I’ve got started on several projects but life seems to be something that happens in spite of your best planning, and with issues such as house building, health, employment and such those projects never got much beyond a tentative start. But the house is, after several years of building, pretty much done. There are always more things to do but it should be signed off by the building inspectors within a week or three, employment is still an issue, I’ve been made redundant from my last three full time jobs and have given up on that so as the health issue improves I’m working more on design and selling more boat plans. That’s not easy in the current economic climate but there seem to be signs that things are coming right in some parts of the world, and hopefully that will continue. Sailing my little gaff sloop has given me a real taste for being back out on the water, the issues that stopped boatbuilding had kept me away from sailing for some years but now that things are on the improve and I’m getting some time afloat the passion is returning, its like an awakening, and about time too. So, the workshop tidy is coming along, I can get at all the machinery, the bench is tidy enough to work on, I spent a whole afternoon just reorganising the screws and fastenings, and while the floor is not properly clear I can at least walk about without tripping over things all the time. My wee boat which I don’t refer to by her given name of “May” which is a bit dainty for what is really a pretty tough little adventurer and I’m going to rename her when inspiration strikes, is a bit heavy and a bit time consuming to take out on the lake for a quick sail of an evening so I am building a boat with that in mind. Now, in the past every boat I’ve built (I’m up to 24 so far) has been an opportunity to try out a bunch of ideas and this one is no different. 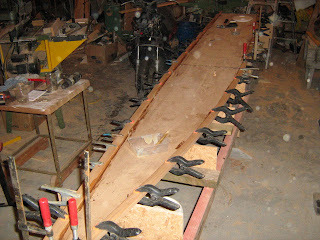 Last year my friend Blair and I pumped out the hull of a light planing sailboat called “Saturday Night Special”. 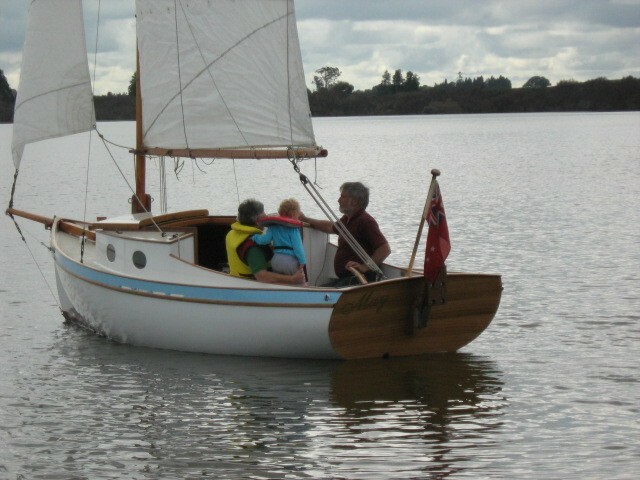 It was a 3.9m (13 ft) stitch and tape balance lug rigged boat, designed so that the builder could make up the rudder, centreboard, frames and transom, put all the bits plus sail into a mountain bike transporter bag along with some basic tools and fly into an event like the Texas 200 (http://www.texas200.com/ do read the photos and accounts, both entertaining and fascinating ) and build the boat before participating. The vision was that a team of two or three would arrive at a venue where some shelter would be available, rent a van, go to the local big box hardware for cheap plywood and lumber, have the very few fittings required plus epoxy and some glass cloth shipped in beforehand from www.duckworksmagazine.com or similar, and for spars buy some alloy pipe from the likes of http://www.onlinemetals.com/index.cfm. Blair and I proved that with some organisation that a boat can be hung together in four or five days, and three couples could easily have three boats sailing inside a week. Rough, but watertight, painted and sailing. At the end of the event, the expensive parts can go back in the bike bag and back on the plane while some lucky soul would get a free boat, or it could have a Viking funeral on the beach. The issue we were trying to solve was how to participate in the event when it’s not practical to transport a boat from somewhere far away (Blair and I are in New Zealand, or at least I am and he’ll be back in a few months). 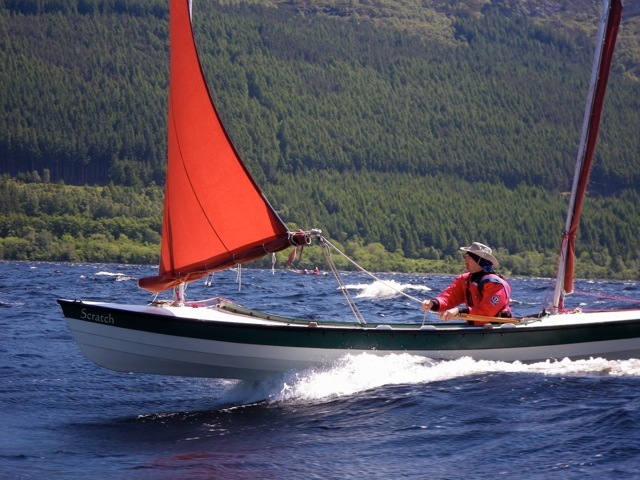 Quick and dirty was the aim, but fast, easily handled, quick to rig, stable, safe in difficult conditions, and in this case designed for sustained high speeds off the wind while retaining good windward performance so the boat can be sailed upwind away from lee shore traps. The prevailing wind on the Texas 200 course at that time of year is a strong quartering tailwind which often sets up a short steep chop in the shallow waters inside the banks that shield the course from the Gulf of Mexico, so S.N.S was drawn up to suit those specific conditions. Blair and I got the hull done, stitch and tape is not my favourite way of building and the cheap plywood did not bend as fairly as I’d like but the boat will work ok all the same. Blair has had “life” happen to him, and the project is sitting while he is away out of the country working so we’ve not seen her in the water as yet. But I had all the frame templates, my tidy up revealed that I had half a dozen sheets of plywood, a heap of various bits of wood, and a whole lot of epoxy. So, I’m started. Here is “Sunday Night Special”, that’s what you get when you begin with a Saturday Night Special and think about it for a bit longer. I’m building “Sunday” stringers over frames, but the frames are further apart than is usual as I’m trying to see where the limits are in that respect, and there are a few other experiments happening as well. There will be a big buoyancy tank each end, wide side decks to sit on but no seats, balance lugsail on free standing mast, on halyard, one downhaul, one sheet, daggerboard and rudder. As simple as its possible to be, note no seats, that’s weight and complication that costs time and materials to build and is weight to lug around. If you want to be comfortable in this boat, go and buy a pool bean bag and tie it in with a lanyard so it can’t blow away. If it works, there will be plans. From the drawing I built this planking model, its 1/10 scale so is about 1.3m ( 4ft 4in ) long, planked up with doorskin MDF its accurate to about 2mm or so and the panel shapes were taken off and scaled up. The bottom and chines laid out, stem up, and Blair is just beginning to lace the panels together before pulling the chine panels up to the stem. Cable ties proved to be inadequate, ok for handcuffing terrorists but not for keeping plywood panels in line. Here is "Saturday" all planked up, the centercase goes ahead of the frame up there just forward of midships. There are a few wedges and fillets of filler to put in yet as this cheap plywood is not very co-operative. Half the deck on, the idea is that the crew will sit on the side decks or in the bottom of the boat, no seats, no frills, cheap fares, peanuts and coke for inflight meals. The beginning of "Sunday". I'm building on a jig this time, the cross members hold her bottom in the right fore and aft curve and level across, the stringers are very roughly ( you'll hear that phrase a lot on this project) pre bevelled to take the chine panel and the stem will be the next thing to be added to the structure. A couple of weeks later, had the time and energy to go out and do some more. I said that the workshop was tidier, you should have seen the mess before! 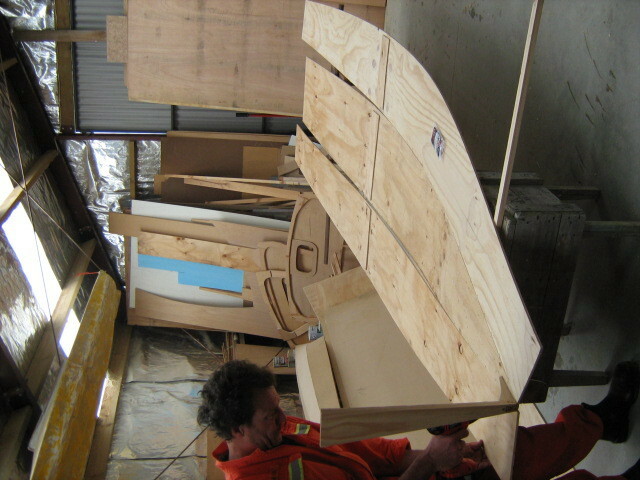 Here I have the transom, after frame, midships and bow frame, stem, king plank and lower mast step in place. View from forward, that vertical wedge shape is the stem, there will be a rounded capping fitted after the plywood is all on. Mast step, seriously well fastened in, this is possibly the most highly stressed item in the boat so I made very sure it was not going to move. The vertical member is the centercase brace, I'm building from a drawing which shows the shape of the hull and the position of the centercase and rig, and the rest I'm making up as I go. I've got the centercase sides cut from scrap ply salvaged from a freinds bathroom rebuild, and thats the next thing to be fitted. Oh yes, years back a freind, ( have more than one!) gave me a set of foils from a decent sized sailing dinghy so I already have the centerboard for this one. Less to build! Sooner sailing! School days with a difference. A couple of years back I had the great privilege of teaching part time at Massey University, Auckland New Zealand. At first I was just there for the occasional presentation on a given subject, then I got a 6 week paper to run, and then at the beginning of the next year Course Leader Bruce Woods paid me the huge compliment of giving me two days a week ongoing. 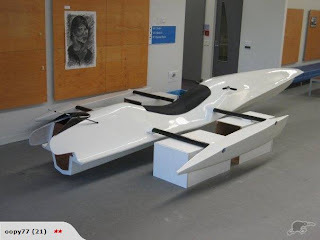 The subject was “Transport design” and my students were specializing in automotive and marine design, my brief was to teach and supervise the design and building of model and full sized projects as well as some which involved “paper projects” . I had classes in years two and three plus mentored some year four students in their grad year projects, they were a wonderful bunch of young people, almost all of whom worked hard and did well. Teaching these classes taught me a great deal, I had to stay a lot more than one page of the book ahead of them as they were all of them pretty bright, and I spent a lot of time researching and swotting up ( cramming!) on each subject before standing up in front of them in the classroom, but even so I think that they taught me at least as much as I taught them, it was a really great experience and I’m hugely pleased that I got the chance. 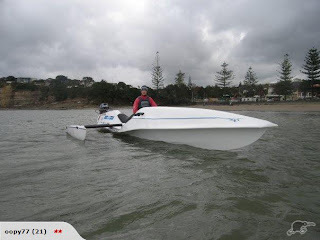 I was surprised and pleased to come across a Trade Me ad for one of the year three projects that I supervised, in this case a group of students were given the use of three 8 hp Yamaha outboard motors with remotes, and sent off to design, build and race three boats. Remember that these had to be designed, materials sourced, built from scratch, tested and run within one semester while the participants were also taking other papers! There were some very late nights in the Schools well equipped workshop! We did a “car” one as well, each team getting a little 1 ¾ hp Honda stationary motor and sent off to design and build a vehicle to travel as far as possible on 100ml of petrol, that’s about 45 mins on the motors most economical speed and the winning vehicle which was a prone ridden motorcycle with hub center steering ( built by the students with the tools and machinery in the College workshop remember ) and a mountain bicycle gear train worked well hewever we didn’t manage to get a really good venue. But the testing we did do gave us an estimate of fuel consumption in the high 800 miles per imperial gallon at about 20 miles per hour which was pretty good, and I am sure that with a longer track and some fine tuning we'd have done even better. For the boats teams were selected, three in two and two in the third team. All three opted for triple hull configurations, the winning one with a comparatively wide and short central hull, the boat being got up stylewise to suggest a stealth bomber. The other two had long slender hulls, one semi displacement with foil stabilizers and the other a very graceful boat with conventional but very slender stabilizing hulls. 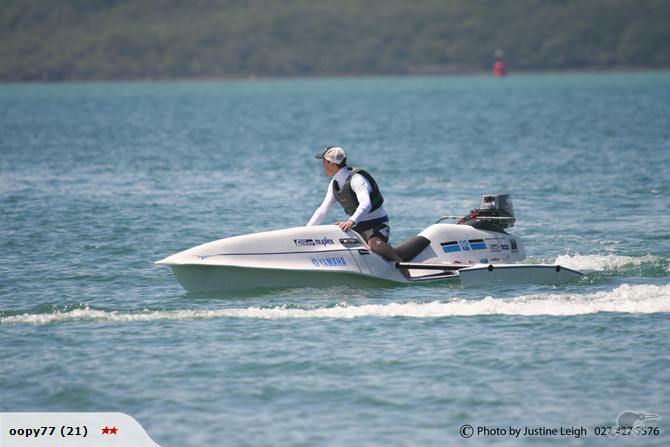 Alistair Thompson, Sophie Amesbury and Tom Bryan built “Tri Ski”, a very smooth looking boat built to a high standard and which performed well in the tests. I’d say that the wetted area was just a little high for the 8 hp motor, but that’s ok, this was to be a learning exercise and the boat was still a lot quicker than you’d expect from the power plant, the handling near perfect and the concept very well executed. Above are some photos copied from the Trade Me on line auction site where Tri Ski was recently up for sale. Well done all that class, I hope you look back on that year as fondly as I do. Not far away from where I live is a village called Hobbiton. Some of you will know of it, I read the book when I was about 10 or so, every few years read it again and it never pales. Its the outdoor set for the movie, the inn, the stone bridge, the Hobbitt holes, the lake and the river, all there and eerily alive, a window into a fantasy. Kiwi film director Peter Jackson did an incredible job of translating the three books of "Lord of the Rings" into visual form, and I had several encouters with the production at various times, A neighbour was one of the founding members of the special effects company whos work was so effective, I did some technical work for a company who made many of the weapons, went on the Great New Zealand Trail Ride, a 6 day cross country ride that my wife and daughter went on and I taggged along as crew and baggage truck driver. The catering company was fresh from the movie set, and several of those horses which starred as mounts for the Nazghul were there in a much less dark role. It was a huge production, and in a country as small as ours there will be few New Zealanders who do not know someone who has had a direct involvement with the production. Its almost a part of our national psyche. Over the years I have been in the many areas where most of the outdoor sets were so the when the movies showed off New Zealand scenery like no other movie before,I really felt "at home" as I watched the big screen, that added enormously to the veracity of the story for me. Now there will be another. The cordless drill that wont. I generally tell people to buy good quality tools on the basis that a cheap tool that does not do the job is an expensive purchase. But sometimes I get hooked by a really good price on something that I’d not normally look twice at. In this case the old Black and Decker 14.4 volt 2 speed cordless drill that I’d got through a customer rewards program about 10 years back was getting tired. I’d gone through three sets of batteries, and the current set were ok but I could see the end of them off in the distance, and the mechanicals were getting very rattley. Time to think of a new one, my choice would have been a Makita 14.4 volt LI battery equipped unit, if you watch the guys building houses that’s a very popular unit. Light, powerful, tough and good parts backup. But, its quite a lot of money, and that’s not in good supply around here so I was putting the decision off until later. However, walking through the big box hardware down the road (You can imaging me at a Hardware Stores Anonymous meeting, “ My name is John and I’m a Hardware storeaholic”. I should go in with a minder, walk around and come out having not bought anything, just to prove it can be done). Anyways. There I was, coming along the aisle with some plastic plumbing fittings for the house in my hand and a sign jumped out and ambushed me. All in a nice plastic case encased in a cardboard sleeve with pretty pictures on it that promise that you’ll be an instant success at whatever you do if only you buy this tool. Some of the Ryobi tools that I’ve had have been very good, mostly the ones I’ve had for a long time. In fact my first cordless drill was a 7.2 volt Ryobi with battery inside the handle, I miss it. It was small, light, had enough grunt to drive medium sized screws, and had a good true running keyed chuck. Absolutley no frills, but then it didn’t need any. It died after a long innings, and about the same time I had a bunch of Fly Buys points about to drop off if I didn’t use them so the B&D came into my life, and its done well. I’ve had three other B&D cordless drills since that, all have been so bad that I wouldn’t even give them away. So, home came the Ryobi, first impressions were ok, it fit the hand well, was reasonably balanced, the variable speed trigger works smoothly and is in the right place, the battery though is a pig to get on and off, I’ve slight arthritis in my thumb joints and it takes considerable pressure to get the battery clips disengaged from the drills body in order to remove it to put it in the charger. Yes I can do it, no its not really a big deal, just annoying. The charger, I plugged it in, dropped a battery in it, and a green light came on. Ok, came back in half an hour, it turned the drill over half a dozen revolutions and carked it. Tried again, read through the very confusing section on charging in the book of words, and tried again. Green light, no result. But there are two lights on the charger, and a tiny recessed button between them. Whats that for? Its printed on the label on the charger, true, but that’s not that clear either, it doesn’t work unless the battery is in there first. Hmmm, try it with the battery in, push the button. RED light came on. Left it for a while, bingo, the green light comes on when charged. Ok, got that. So, off to work, reasonable torque, not as much though as the tired old B&D even now, the slip ring behind the chuck that changes it from one torque setting to another is too easy to move which means that it goes from drill (no torque limitation ) to one of the settings where it stops and growls at you if its required to work too hard and you have to stop and reset it. But its still a drill, and still does its job, or would if the chuck was a bit better. This is the real grumble. While it is fine with hexagonal shaft screwdriver bits, its not able to hold a drill bit with any competency, any size at all, any torque of any consequence and no matter how tight you wring the thing up the chuck goes around without the drill. You know how a drill bit hangs up a little when it gets to the other side of a piece of metal? This one allows the drill to stop while the chuck merrily goes on discharging the battery. Even with aluminium or copper. Or wood for that matter which makes it really annoying. So, I’ve a drill that can only be used as a screwdriver, and STILL need to buy another cordless drill. I should take my own advice. Tail lights for the trailer. A new boat will always have a few things that need to be altered or added to make it ones own, and there can be much quiet pleasure in doing that. 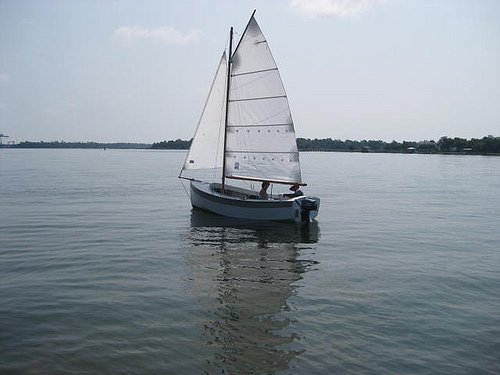 With a boat that comes home on its trailer that puttering around with tools brings the pleasure home into the backyard thus extending the involvement with boating and the water into time that should really be spent mowing the lawn or whatever. It’s a much more pleasant way to spend an afternoon. Agreed? However, boats on trailers also have trailers to customize, and while I’m not as enthusiastic about that prospect it has to be done. When I got this wee boat of mine she had a piece of white plastic square section tube, all wired up and looking nice, but it had no way of properly mounting it on the after end of the boat, it bounced around chewing up the varnished coamings and toe rails and, to be honest was not that secure when under way on the road. In the end it dropped off and destroyed one of the lights which meant that doing something about it came abruptly to the top of the “to do” list which was feeling good about having reduced to about 2 pages long. So, with bottom lip out, I dragged a piece of 20 x 90 ( ¾ in x 3 ½ in about ) pine out of the rack and cut it to the same “beam” as the trailer across the mudguards. Went down to Super Cheap Autos (the Wal Mart of the Australian and New Zealand motor parts world, you can have cheap or good quality, one guess what they have!) and bought a pair of tail lights with tail, indicator and stop lights plus a clear window for the tail light to illuminate the number plate. The cable and plug from the old system was ok, I checked all the wires for continuity using a 12 volt battery charger and a spare bulb from one of the discarded lights as a test rig to ensure that although it had the dreaded black corrosion on what should have been bright copper wire at one end, it would work. I had plenty to spare so cut it back to the bright stuff at both ends and after tinning the ends with solder coated the ends of the insulation with silicon to try and avoid that in the future. While it wont ( hopefully) be coming into contact with salt water it will be out in the weather so some care was warranted. Now, the real problem here was how to mount said lights on the back of the boat, and while the boat itself does not present much in the way of opportunity the outboard motor bracket is just right. Right height, aft of the transom, nothing to obstruct it and clear of the boat at the sides so the forward facing clearance lights would be easily visible. I’d recently changed the woodwork on the bracket, it had been such that the power head of the outboard motor had not sufficient clearance from the transom to allow it to be easily operated so I’d made a new wooden pad that moved the motor out 20mm and up 50mm which made life very much easier when using the little 3 hp longshaft Tohatsu. ( I’ll tell you about that motor another time, I’m quietly reasonably impressed with it.) That meant that the top edge of the motor pad formed a 180mm wide, 36mm thick tongue sticking up 120mm from the metal part of the rise and fall bracket. I made a couple of pads, just a couple of mm thicker than the “tongue”, each pad the depth of the light board and about 80mm long, then screwed a section of the same 20 x 90 across to form a socket into which the “tongue” fit reasonably neatly. I didn’t want to fight with it to get it on or off, but I didn’t want it too sloppy either and it took a couple of dry assembly runs to get it right. Glue and screw, screws overlapping where they went through the spacer pads and the two main pieces so it cant split off, added a piece of plywood as a number plate mount and painted it with white housepaint. Mounted the lights and wired it up. Electricity was invented just to annoy me, did you realize that? Other people have no trouble at all, but me? Grrrrrrrrrrrrrr! But I got it done, all ends tinned, all insulation silicone at the end of the shielding, all wiring properly secured and with some slight faffing around SURPRISE ! It all worked! ! Drawing a circuit diagram before I started and being very careful with the many colours in the wires must have paid off. The outboard bracket, yes I should have reorientated the pic before I put it in here, but you can see how it works. The 20 x 90 light bar with the bracket ready to trial fit . Thats scrap plywood left over from a house project, you use what you've got. Same again with the orientation of the pic, sorry. But thats the lightboard all mounted up, shock cord stabilising cord visible at the far end, I tried to secure the wiring with hot melt glue but it doesnt want to stick and I ended up with stainless steel cable clips. The finished result, looks good, nice and tidy, easy to mount and dis, highly visible and about 3 hours work in total. I added some reflectors so it will be more easily seen by following cars, stabilized the rig with a couple of shock cords through the fairleads on the stern quarters to the mooring cleats, run the cable to the car along the side decks inside the sheet and stay points and out through the bow fairleads, through the trailer winch post and thence to the car, all nice and secure but will only take a couple of minutes to rig. Should I wish to use the trailer without the boat, the lightbar will simply be strapped across the back of the trailer frame with the shockcords, and when left in the car park while I sail off into the sunset will fit comfortably into the car, cable and all. Tick. One less job on that %(*^%# list. Good, now to go sailing.